Like I said in a post a few months ago our parking lot is a cat ranch. 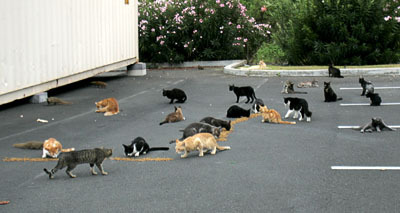 Here the feral cats along with mongoose feast on cat food poured in a line by one of those crazy cat people. These folks should take all of these cats home if they don’t mind the cat poop, dumpster diving, yowling at night and cat spray on cars. They can take the mongoose too while they’re at it. The lady delivering the cat food has upgraded to a minivan or maybe it’s a different person that did the moped cat food deliveries. Speaking of eating I’ve been visiting a local blog with great photos and descriptions. She who eats will make you hungry, there’s no way around it. Now could we get her to write/photograph for our paper? I’ve added her to the links on the right. Next PostNext Hey! I am the press and I am driving, to where?